Man, you've made me afraid to draw now. Great Job! That drawing is amazing! That is amazing! I can't believe you drew that. It's like it's from a real artist. Omg, you're an artist! Omg, you could be a real artist. Do not believe any of those people. You're an artist! So cool I wish I was that good I only get some of my drawings to look good. She does a great job, doesn't she? We'd love to see some of your drawings too Rayden! Ohmygod!!!!! You're the best at art!!!! I'm an artist too, and to get such amazing shading is my dream! My horses come out pretty realistic, but this takes the cake! I love it! If anyone says you didn't draw it, I think they are crazy. Please, if your interested in emailing me, I would loove to talk about art and swap tips! comment here. Keep up the good work rayden! Don't listen to those meanies it is fabuloso!!!!!! I could never draw like that. Never stop no matter what people say. They're just jealous because they can't draw like you. I agree with you horseloverforevernever. Hey, my name is Sienna and how did you get the drawing so detailed?!!!!!! your good. 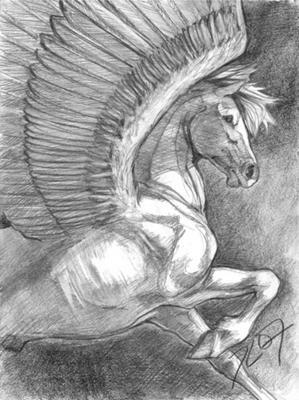 I love to draw horses and look at picks of horses but this is one of the best drawings I'v ever seen! This was not drawn. I have a Bella Sara card with the EXACT SAME picture on it. This was drawn by Fie Tholander. The bottom of my card says it. That's a wonderful picture... It looks like it took a while, there's a lot of detail. I saw that picture on a fantasy site. Are you sure you drew that? I can draw really good horses but how old are you? im 10 so if ur 20 or something then i have an excuse not to be as good as you. You did not draw it someone on another site did.